The Nightmares and Darkness tour has started! 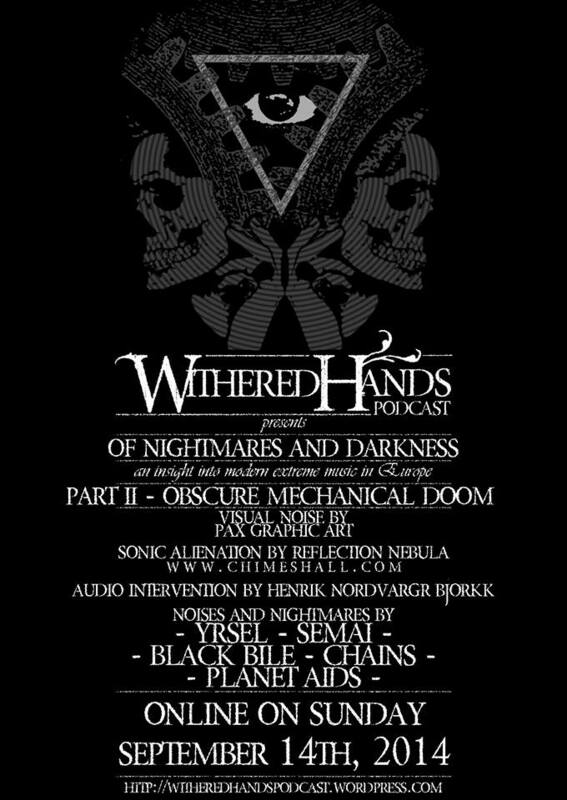 “Of Nightmares And Darkness” the show in four episodes aiming to give an insight into modern extreme doom metal music in Europe started last week and this is its second episode! As you might know if you’ve listened to the preview show or re(a)d something about it , we tried to gather European bands who tried to converge in their style loads of different influences creating something somehow “new” in what is the typical music direction of most of the modern funeral doom metal bands. As for the first show, this project is not just about those bands! During the show we play some other funeral doom metal bands and we try to find artists willing to give an image to rappresent the show and the main idea behind the show. We want to get the listener 200% into the show by getting him lost into it, feeling the nightmares and darkness we named the show after. On this second show, titled “Obscure Mechanical Doom”, we start talking about some of the influences of this new genre and we take in consideration those coming from industrial and ambient. PAX GRAPHIC ART, who provided us with the image rappresenting this second show. REFLECTION NEBULA, the Russian band created by Vladimir Frith, who provided us with the background music you can hear during the whole show. Quoting the mysterious sentence on his internet site and Fb page: “It takes millions of years for starlight to reach our system. But some of it can be seen and even heard as of right now.” I think this could be a perfect description for what he tries to create with his music by mixing dark ambient, drone e doom together. HENRIK NORDVARGR BJORKK one of the greatest and most influential post-industrial artists ever! Here I’m goin to link some of the pages of his main projects! There’re also some more pages linked to H. N. Bjorkk’ projects so please take a look through internet if you’re looking for infos about MZ 412, Thoroidh, Folkstorm etc. We really hope you’re goin to like this second show and you’ll find interesting the amazing bands we’ve played! The third of four parts of OF NIGHTMARES AND DARKNESS will be out around the end of October due to some other shows we’re goin to prepare! Please share and support the underground!